i am quickly learning that summers in seattle don’t start until after the 4th of july, which makes it fairly easy to get inspired to make one of my all time favorite things: soup. this one was a bit experimental in terms of the fact that i had no idea how it would turn out since i was solely going off of what i thought might taste good. 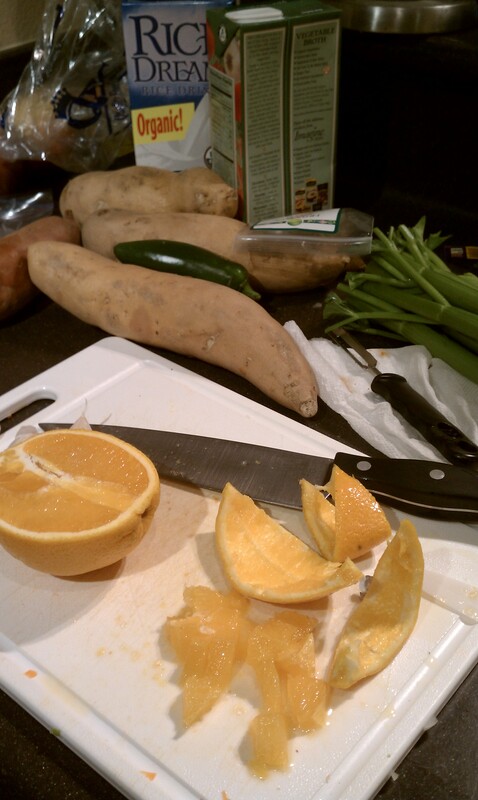 i had recently tried a sweet potato soup and somehow felt compelled to make my own. having tasted the finished product myself i felt it worthy to make the blog. it is that good. please keep in mind i am the queen of throwing stuff together without exact measurements so this is a guesstimate on the ingredient amounts. in a large soup pot, drizzle 1-2 tbsp olive oil over medium heat and let warm up for about 5 minutes. 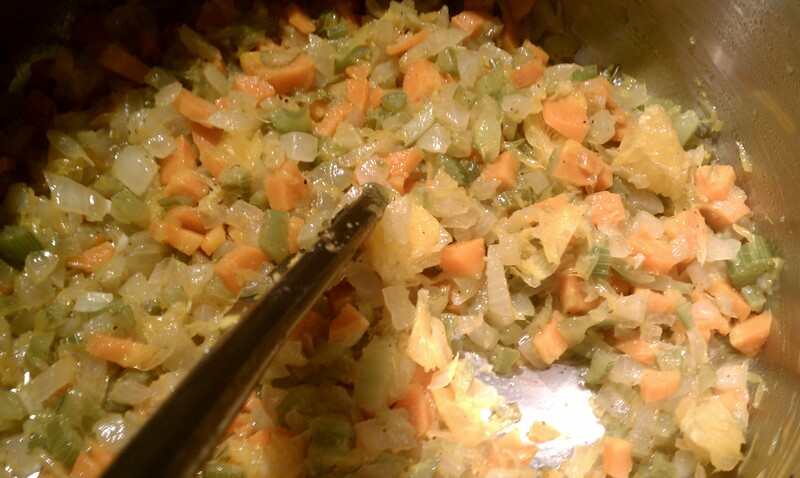 throw in diced celery, carrot, onion, jalapeño, garlic and salt. let cook for 10 minutes to soften. 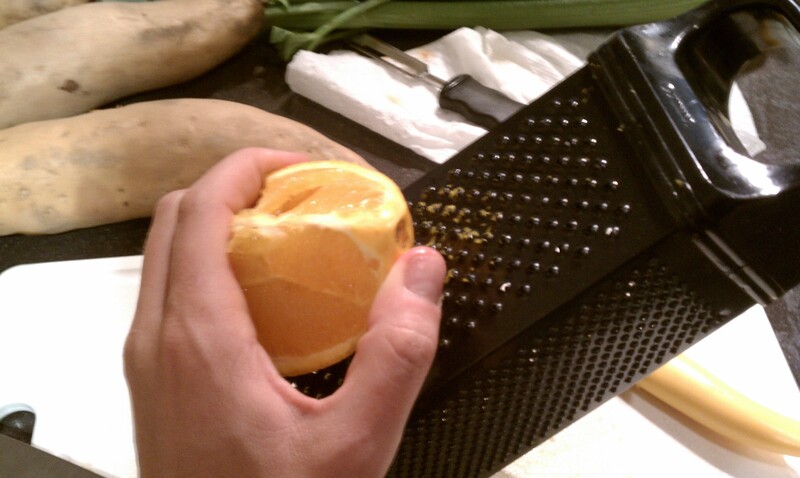 next, grate about 1tsp of orange zest and add to cooking veggies. throw in chopped orange and 1 tbsp of cumin. stir around and let cook for a few minutes. throw in 1/4 cup vegetable broth to add some liquid to the mixture. it will smell delicious! 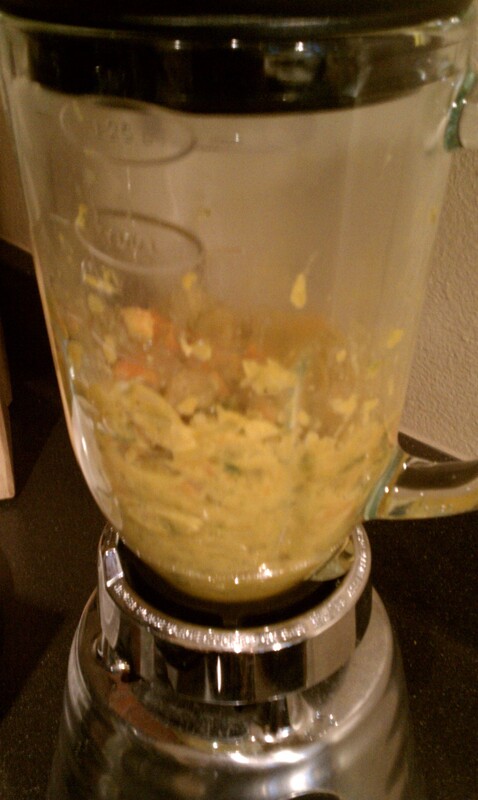 then, emtpy the pot of cooked veggies into the blender and puree it all. generally takes a few minutes. if you need to add more broth to get everything blended, do so. pour rest of the box of vegetable broth, 1.5-2 cups of rice milk, and pureed vegetable mixture into the soup pot. stir over medium heat and add 1 more tbsp of cumin. salt and pepper to taste. now onto the sweet potatoes…because i was lazy and felt like cooking the sweet potatoes fast, i wrapped them up in saran wrap and shoved them in the microwave for around 5 minutes. you want them to be cooked through to the point of being able to mash. peeling them prior and poking holes in the wrap helps the cooking process. in a separate bowl, mash the potatoes with one cup rice milk. 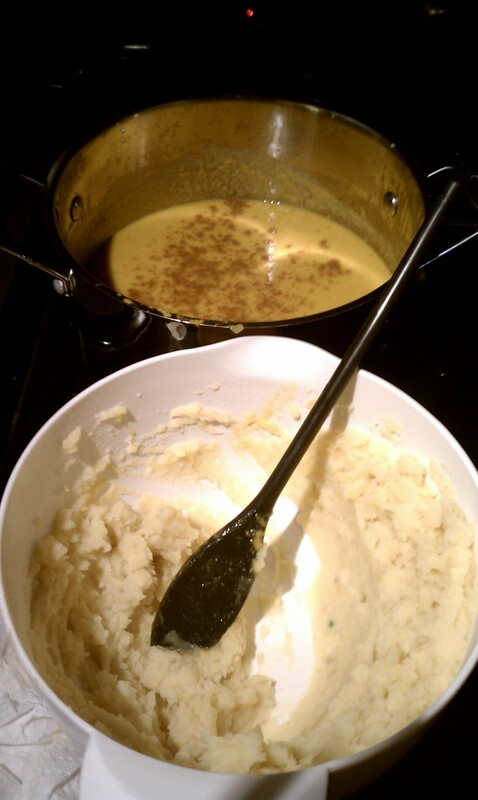 i used a hand mixture to make sure the potatoes were blended to a smooth and creamy texture. add salt and pepper to taste. spoon potato mixture into soup pot stirring occasionally to make sure it mixes in well. 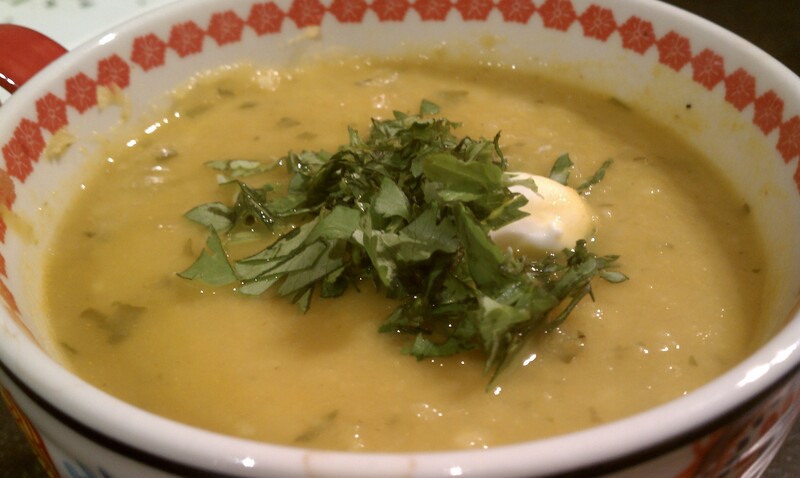 lastly, stir in 1/2 cup chopped cilantro and a bit more cumin. cook on low for another 10-15 minutes. 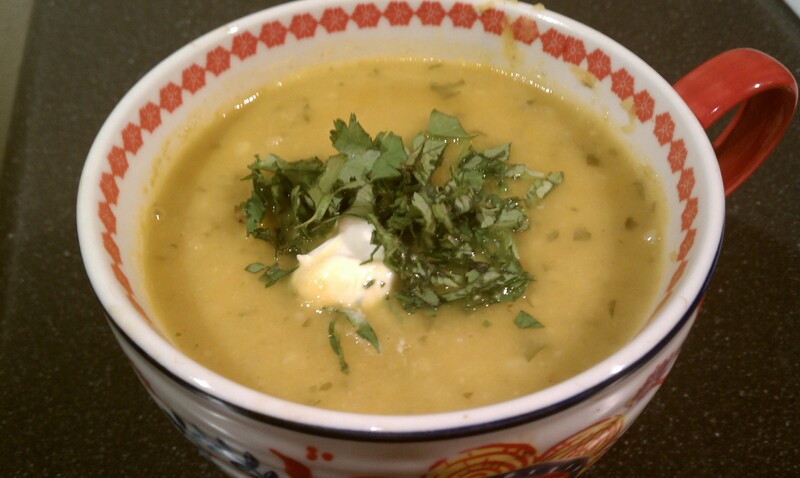 you want the soup to be a smooth, creamy consistency. garnish with fresh chopped cilantro and if you are like me and sometimes have a need for sour cream, add a dollop of that onto the top…the non vegan version. enjoy!